My Grandma Queen made the best bread pudding in the world to me. It was not have the custard feel to it like more bread puddings do which is good because I do not like custard or eggs. She came up with this recipe during the depression and she had 6 kids plus a husband, lots of chickens and a huge garden to care for. As we all know money was very hard to come by during the great depression. 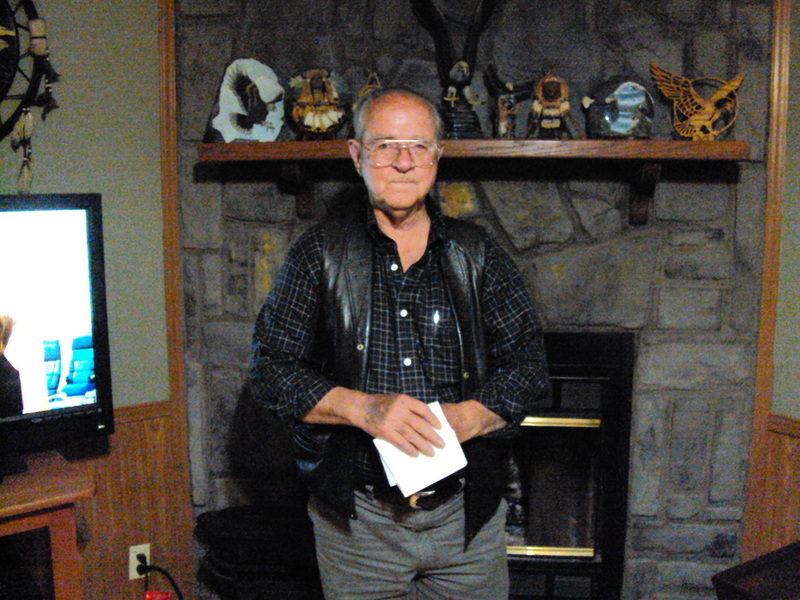 Even though my grandpa worked as a coal miner times were hard for him and my grandmother so they had to learn to be very frugal. Grandpa passed a bakery every day on his way home from work so he would stop and buy the day old bread to feed their pig they were raising for meat for the winter. Some times he was able to get a lot and some times just a couple of loaves. On the days he was able to get a lot my grandma would keep out a few loaves to make things for the family to eat, like dressing, french toast and her bread pudding. Because my grandma had so much work to do she came up with some easy recipes to fix her family meals. Like her bread pudding. It was easy and cheap and fed them all. When she made the bread pudding she always made a big pan of it and if the kids were running late for school all they had to do was cut a piece and walk out of the house eating it on their way to school. You don't need a fork or spoon for her bread pudding. It really is a easy recipe. Place the bread in a big bowl. Add sugar, raisins and cinnamon. Mix well. Add beaten egg and just enough water to moisten the bread so it will hold together. Spread the mixture into a buttered 13 x 9 inch pan and spread it out evenly. Bake at 350 degrees for 30 - 40 minutes until it turns a nice golden brown. Place on rack to cool. Once it is cool it will hold together like a doughnut and you can eat it with your hand. I will warn you thought that it is a little sticky from the sugar. It is nothing for me to walk around the house or outside with a piece of bread pudding in my hand. I love it. Some people feel it is a little gummy but to me it is not. It is just good and moist and oh so good. You can use other dried fruits, I just happen to like raisins the best though I have used dried cherries, cranberries and dates in it. Do not use fresh bread with this recipe. It turns to mushy. I go to the bread store and buy day old bread and let it sit a couple of more days before using. Regular white bread or french bread works well in this recipe. Wheat bread might but I do not like wheat bread so I don't use it. Add just enough water to make it hold together. You don't want it to wet. When it turns golden brown and puffed up in the middle it is done. It will deflate and become fairly even as it cools. As soon as you take it out of the oven you can sprinkle a cinnamon sugar mixture over the top to give it a little more sweetness. I use to do that but when I became a diabetic I quit doing that to cut down on some of the sugar. I am the only one of over 50 grandkids that still make grandma's bread pudding. When I lived in Michigan I had to make enough for my family plus my mom and several of her brothers and sisters as well. None of them ever bothered to learn how to make it but they loved to eat it. I learned her recipe from memories of watch her make it and from the taste her's always had. It took me a few tries before I got it right but I finally did and am so glad I did. I always loved her bread pudding. Eating it now brings back wonderful memories of sitting at the kitchen table with her eating a piece of bread pudding and drinking a cup of hot tea and just having a nice talk about the old days. She was the only grandparent I had in my life while growing up. All the others lived far away and I never saw them. She has a big influence on my life and I love her dearly even though she has been gone 20 years now. I miss her so very much. She was a wonderful grandma. Okay I admit it. I am a cast iron junkie! I get my highs off cooking in cast iron cookware. Cast iron cookware cooks like no other type of cookware. It gives food a better taste then any other cookware and in my opinion it cooks more evenly and better. Plus I don't have to worry about chemicals coming off the coating and into my foods. Cast iron if taking care of will last for generations unlike Teflon cookware. I am the third generation to use my grandmother's 12 inch Griswold cast iron skillet that was bought in 1930. I love that skillet and have had it for about 12 years now and have never had to season it. It was well seasoned by my grandmother and mother who used it for years before it was passed on to me. And it will be well seasoned when I pass it on to my daughter one of these days. I have a decent collection of cast iron cookware from skillets to dutch ovens, griddles, roasters and even the Lodge Sportsman grill. Today I want to talk about a new piece I was recently sent by a very good friend. It is the Bayou Classic 7470, 20 in x 3 in baking pan. It is huge and barely fits in my oven but I love it! It is a great piece to have and very useful. I have used it quite a few times since I got it. It is great for cooking for a crowd or even just for a few. The first thing I made in the baking pan was biscuits. They turned out so nice and pretty as you can see here. My husband said they were the best biscuits I ever made and that was saying something because my biscuits are always good according to him. :) I have made biscuits 8 times in that pan since I got it and he always brags about how flaky and tender they are because you can peel them off in layers like those store bought canned flaky biscuits. The trick to getting your home made biscuits to come with layers is simple. Roll out your dough, fold it over in half, roll again, repeat the process 4-5 times rolling out lightly each time. Cut with a biscuit cutter, place in a pan and bake. 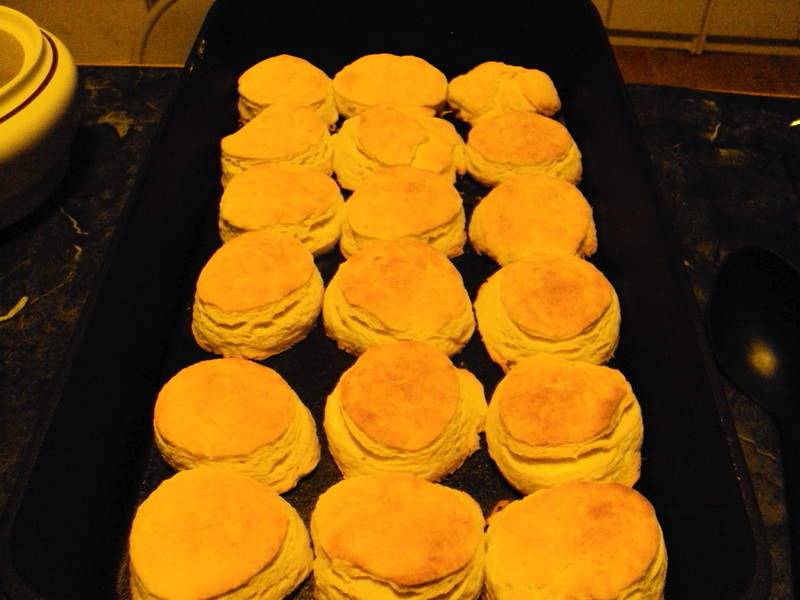 As you can see in the picture of the done biscuits there are layers in the biscuits. The pan is not only good for cooking biscuits. It also is good for cooking a pound of bacon in the oven. Sorry I forgot to take a picture when I cooked bacon it in but I can tell you it came out nicely browned and crisp with no burning or sticking. I have also baked stuffed pork chops in it and they came out so nice and tender and beautifully browned. Just thinking about them and remembering how good they tasted is making my mouth water as I write. 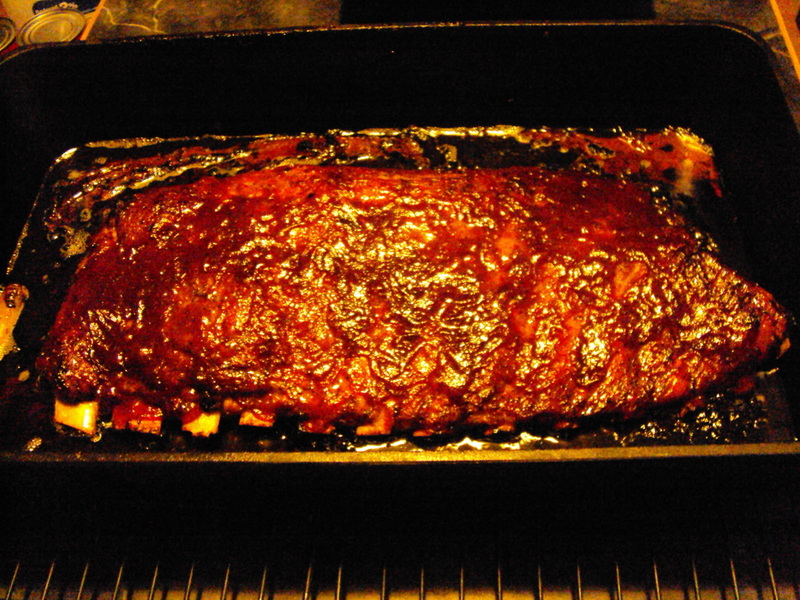 The lastest thing I have good in the pan was barbacued pork ribs. All I can say about the ribs are they are heaven on a bone. 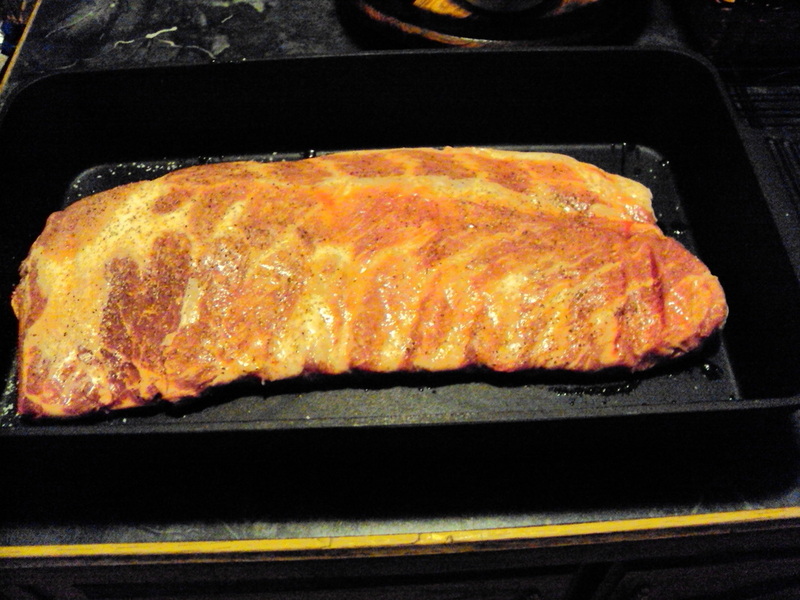 I just placed the rack of ribs in the pan seasoned them with a little salt and black pepper and placed the pan in a 350 degree oven. I baked them for a hour and a half then took them out basted them with Sweet Baby Ray's barbacue sauce and placed them back in the oven for 15 minutes. The ribs came out so tender and juicy. I was able to eat two of them and the men folk ate the rest. LOL Even I have to admit they were the best ribs I have ever cooked. Personally I think the pan is what made them so good, not anything I did. Now you might be wondering why I am talking so much about this pan because this is a blog about prepping and homesteading. Well I feel this pan fits in well for both things. You might be wondering just how I plan on using the pan if SHTF and I can no longer use my electric oven. It's quite simple really. I can use it on my big stainless steel gas grill and when the gas runs out I can always convert the grill to charcoal or wood and still use the pan. It may not be practical if you plan on bugging out to a retreat if SHTF but if you plan on staying put it will be well worth the money it costs to acquire one. Truthfully I can not say enough good things about this pan. It's a beautiful piece of cast iron and I will be using it for many many years before one of my kids ever get their hands on it. The one thing I do wish about it thought is that the friend that sent it to me lived close enough to come and eat meals with us. I think she would love the food being cooked in the pan she so lovingly gifted me with. Thank you again my friend for sending me such a beautiful piece of cast iron. I love it! I can't have a garden. I don't have the space. I can't begin to count the times I have heard this. A lot of people think just because they have a small yard or live in apartments they can not have a garden or grow any of their own food. Other excuses I have heard is that they are disabled or gardening is to much work or to expensive. The worst excuse though is the one I heard the other day. A family member asked me why did she need to try and grow a garden when I am going to have more fresh produce then I can possibly use before it will go bad. Well I have news for her. She will not be getting any of my fresh home grown produce because what we do not eat right away will be preserved for future use. I am not spending all that time trying to grow as much as I can to only give it away to others. I have myself and my own family to think of first and foremost. I have quite a few of these bags and I don't really need that many to go grocery shopping. I only paid 99 cents for each bag and that can be cheaper than buying pots plus each bag can hold at least two plants depending on what you put in them. Here is a picture of some of my shopping bag planters. Each bag has two pepper plants in them. I filled each bag with 1/3 layer of wood, then a 1/3 layer of dried leaves. Topped them off with a mix of potting soil and the red clay dirt out of the garden area. Everyone down here tell me how good things grow in that red dirt but I feel the dirt has to much a clay quality about it so I used a 50/50 mix of it and the potting soil. I put the wood and dried leaves in first so they would have a chance to turn in to compost for next year's garden while the plants grow in the thick layer of dirt in the top part of the bag. I folded the tops down 2-3 inches to give the bags more support at the tops and hopefully keep the straps from blowing up and hurting the plants. I like to reuse, recycle and refurbish things in to new uses instead of throwing them in the trash. Every time one of us as been in the hospital I always brought home the pink plastic bath tubs they gave us. I have used them for washing hand wash items, soaking our feet in after a long hard day and even for carrying things around the house to put away. It has been a long time since any of us were in the hospital so I only have 4 of those tubs left. I am using them as planters. I simply drill a few small drain hole in the bottom, add a thin layer of gravel and fill with dirt then pot the plants. Here is a picture of two of them. As you can see in the picture below I will use anything to grow something in. This time I used a plastic witch's cauldren that I drilled holes in the bottom of, filled potting soil and planted a basil plant it. I have already picked the biggest leaves 3 times and need to do it again. I used to fill this cauldren to the brim with candy at Halloween to pass out but now we live to far out and no one trick or treats on our road as there is just not enough houses to make it worth their while. This plant was about the same size as the Bee Balm when I brought it home and it has been growing like wild fire. We have been enjoying adding fresh basil to our meals. When we moved I had over 40 big Rubbermaid and other brands of large totes. I had bought them through the years when I had a childcare business in my home. I used to totes to store things in for my childcare and for storing holiday decorations. When my health became to much for me to continue working I sold all my childcare things and 95% of my holiday decorations but kept the tubs. I knew I would use them all again for some reason and I did. They came in very handy for packing when we moved south last Aug.
Now they are coming in very handy again but this time for growing food. Here is a couple of pictures of what I have planted in some of them so far. I fill each tote 1/3 full of wood then 1/3 full of dried leaves and topped everything off with 1/3 layer of potting soil. All the wood I am using is the cut off slabs from trees that the sawmills discard when cutting boards. None of this wood has been treated with anything. The two totes in the back are red raspberries. The small one was a lot bigger until Jake decided it needed to be trimmed back. The left one in front is cayene peppers and the one on the right in front is brussle sprouts. Each of these 4 totes hold onions. I should have enough onions to last us all winter. The pot behind them hold a single cabbage plant. Another thing I am recycling in to planters is 2 liter pop bottles. I washed them out very good with hot soapy water them gave them a good rinse. Once they were dry I drilled 3 drain holes down the length of one side of the bottle then on the opposite side of the bottle I cut a large opening, filled with potting soil and place two lima beans in each bottle. As you can see some of the beans have already started to sprout. I have another stack of skids that is full of pop bottle planted beans. Since I am running low on skids, right now the bottles are right up against each other. Later this week after I have a chance to pick up another load of skids I will be spacing this out more to give them plenty of growing room. I figure I should be able to get 24 bottles to a skid once they are spaced out. Because of my disabilities I can not garden like healthy people can. I have to look for ways that I can use that will not cause me a great deal of pain. One thing that hurts me the worst is hoeing. I just can't no longer take the pressure of holding the hoe and chopping at weeds so for me raised beds will work for me. I did not have the money to buy wood to use for building the beds and the ground where I wanted to put the beds is still just to wet to try to even walk in let alone build anything so I am using the skids we originally got to Hubby a shed. We can get all the free skids we want where my son works. We just have to load and haul them ourselves. My son helped me stack the skids 4-6 high depending on what I was going to plant on top of them to make them waist high so I can garden in comfort instead of pain. I forgot to take a picture of the stacks but will for future post since I have a lot more planting to do. So you see? You can grow a garden no matter what the size of your space. No matter what your disability might be. It can be as simple as a few pots of herbs growing in a window to spinach, lettuce and other greens planted in some type of planter in front of any big window or tubs of plants sitting on a porch, deck or balcony. Now is the time to start learning how to grow a garden. Don't think of waiting until SHTF. Any experience you learn gardening now will help you even more when SHTF. Besides wouldn't you love to be able to have fresh to the table vegetables that you just picked over the ones that may have been picked a week or two ago? Nothing beats the taste of a sun warmed tomato. YUMMY! Over the last 3 years or so I have had the great fortune of meeting some wonderful people online. These people are all preppers and they have reached out and taught me and others so much about prepping. These people not only teach but they live what they teach so their experience benefits those who are new to prepping so very much. I know it has me. Yesterday I had the very good fortune of getting to meet one of my best online friends face to face. He stopped by for a brief visit on his way home from visiting his father. His name is Ernie and here he is in front of our fireplace. We really enjoyed his all to brief visit but understand he was needed back home. We do wish he could have stay longer and hope to see him again soon. Ernie and my husband got along great but then I knew they would. They are a lot alike in their thoughts, feelings about things and actions. They may not see it but I sure did. They enjoyed trading trucker stories and both kept me smiling and laughing at the things they were saying. Here is a picture of Ernie and I together. 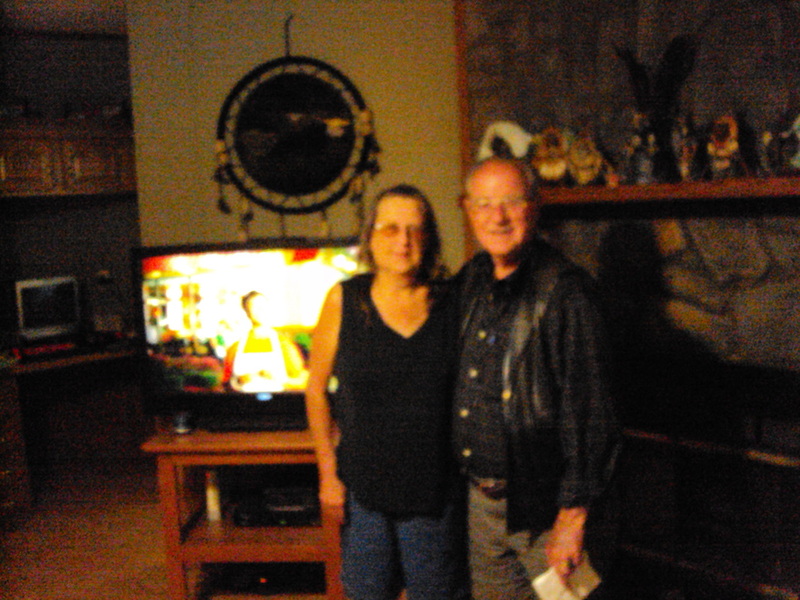 It is a little blurry but one of the meds my husband has to take makes his hands shaky so he did the best he could to take the picture. Preppers often get a bad rap by those who do not prep but I have found that most of them are very nice people with hearts as big as the great outdoors. Oh and if you ever get a chance to meet any of your online prepper friends if you feel comfortable doing it I would like to encourage you to do so. They can be a great asset and teach you something you may have not known. You might wonder why I said my future food preps but I consider my garden to be just that: My future food preps. I am planting fruit plants and trees as well as vegetable plants this year. These plants and trees will provide fruit for us year after year and that is why they are future food preps. 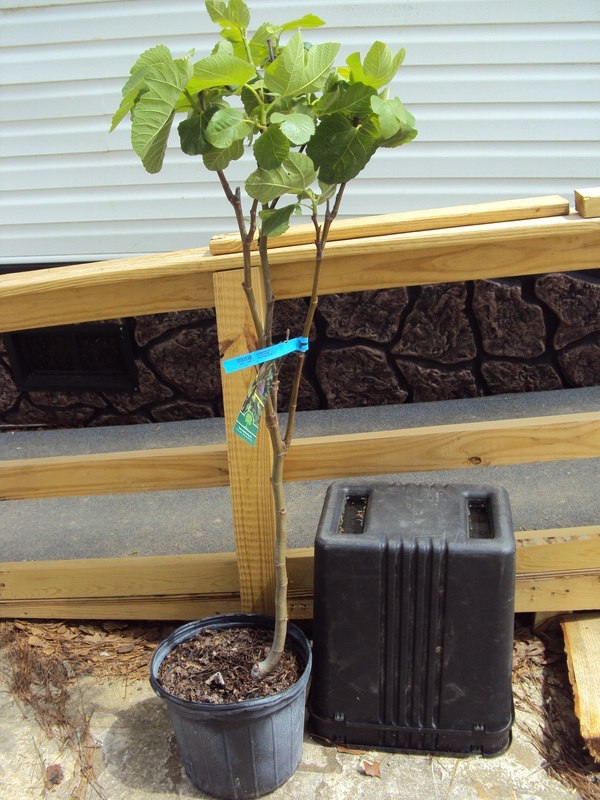 Today I finally picked up my fig tree. It is called a Texas Everbearing Fig. I love figs in just about any way you can get them but dried figs are my fave. Red Raspberries are my all time favorite fruit. I was heartsick when I was told that they would not grow down here in the south but a few months ago I found out that the people from Old MISS had come up with a type of red raspberries that will grow and produce well down here. I have been on the lookout for the plants and found them today when I went to pick up my fig tree where my son works. I got two of the raspberry plants. I also picked up 9 cabbage plants, one rosemary plant and one sage plant. I need to get a nice herb bed going. With all the herbs that I cook with it would be cheaper and the food would taste better if I grew my own herbs. Because my son gets a discount on what ever he buys where he works I am saving quite a bit of money by buying my plants there. All these would have cost me $56 if I had to pay full price but because of his discount I got them all for $38.92. That is a good savings in my book. :) And a good start on my future food preps. There is a thrift store down here that I have been meaning to stop at for the last couple of months but my hubby is always with me. I don&apos;t ask to stop because that means he would have to wait in the van by himself while I spend time looking. He doesn&apos;t mind but it always makes me feel bad to make him wait on me while I browse like I like to do. Well today, I was by myself and in the area so I stopped in. They had a good sale going. Every thing in the store was 50% off and they had some really nice stuff. I really didn&apos;t need any clothes so I headed straight for the household goods section. There I found a nice stackable storage container. 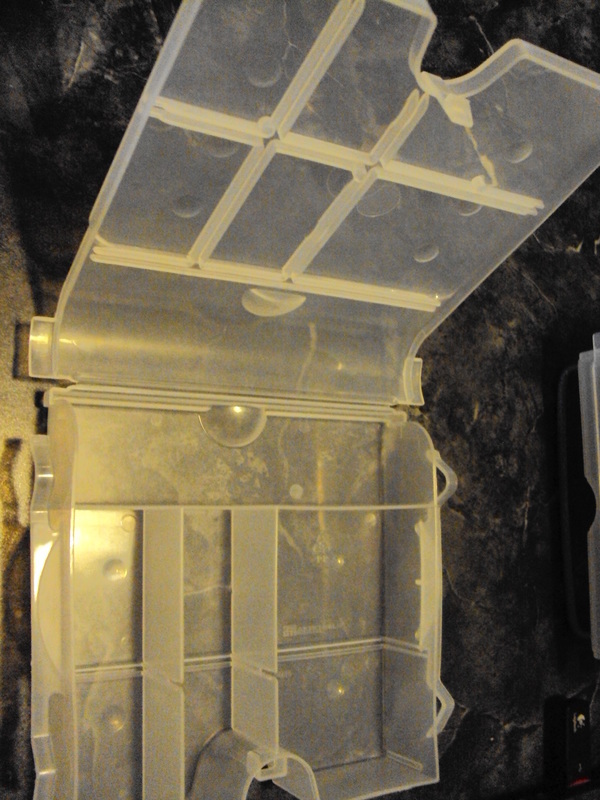 It has 6 little storage containers that have compartments in them. The price on it was $2 but with 50% off I only paid a $1 for it. It can either be hung on a wall or stand alone since it has a nice metal brace on the bottom to allow it to sit up straight. Not a bad deal for a $1 right? I am going to use this to make a first aid kit for my son&apos;s bathroom. He does not have much storage space in his bathroom so this can be hung on the wall. 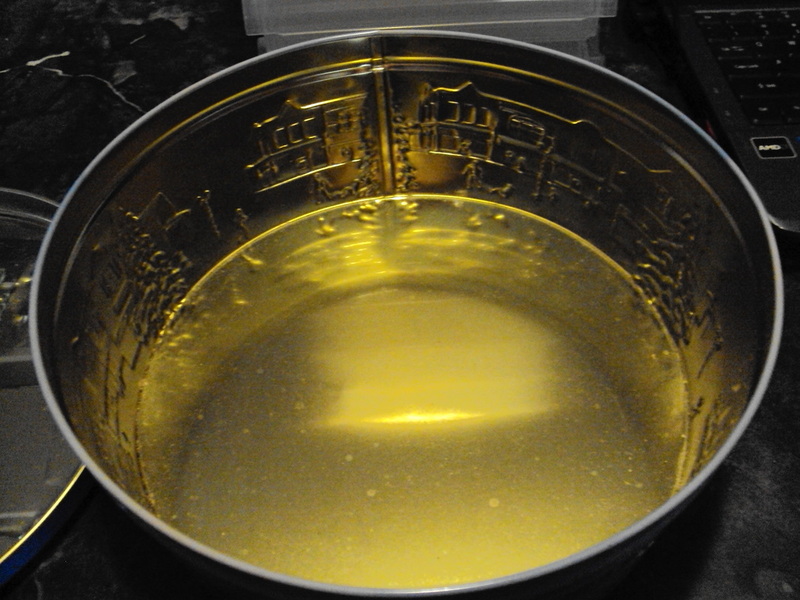 I had originally stopped at the thrift store to find things I could use as molds to make soap but the only thing I found that might work is this 13 x 9 glass baking dish. It was marked for $2 but I only had to pay a $1 for it. I collect tins. Candy tins, cookie tins, tea tins any type of tins. I have been collecting them for years. I used to just display them but about 6 years ago I started using them for food storage. I keep bags of chips, dried fruits, candy making supplies, bags of powdered sugar and brown sugar and any other food items that will fit in them to keep bugs and mice out. I found this tin at the thrift store today marked 50 cents but I got it for 25 cents. It may not look like it but this tin is big enough to hold 4 dozen home made cookies easily. I also check the tins I buy all over to make sure there is no rust on them so as not to ruin my food I plan to store in them. I will admit that I mainly collect Christmas tins for two reasons. Those usually have the prettiest designs on them and I keep some set aside to use for homemade Christmas gift of cookies and candy. All together the total of my thrift store finds came to $2.41 but since this thrift store is run by senior volenteers to collect money to fund the local Christian Hospice center I gave them $5 and told them to put the change in the cash collection box next to the check out counter. I know it was not much but that was all the cash I had on me and every little bit adds up. Dizzy is a 2 1/2 year old full blooded German Shepard. She went through police K-Nine training when she was younger and passed all except the weight limit. She was 20 lbs over weight for their limits. Unknown to her handler at the time Dizzy had a thyroid problem that caused the weight so Dizzy was put up for adoption. My husband's nephew adopted her and had her for about a year and a half but had to get rid of her because his grandkids were stepping on her and she would nip lightly at them. He was afraid that one day she might nip a little to hard and really hurt one of them. He asked us to take her because he wanted to make sure she went to a good home so we did. Dizzy is well behaved and a lovable dog and we have been told that once she is use to you she becomes very protective of you. She had a operation that took care her thyroid problem and is now in great health. Dizzy should become a very valuble asset to us if SHTF or if some one just tries to break in to the house. I look forward to her getting use to us and becoming more comfortable with living with us. As some of you may remember I am deaf. I do wear hearing aids but even then I still can not hear everything. When I lay down I have to take my hearing aids out because I have permanent tubes in my ears to let fluid build up drain out. If I left my aids in my ears at night they would be completely plugged up by morning and would have to be sent away to the makers to be fixed. Because of my hearing it would be easy for some one to break into the windows of my bedroom at night and get in and I would not know it until it was too late. That is a risk I do not want to take when SHTF so I have come up with an idea to protect my windows from break ins. I bought 3 climbing roses a few weeks ago and planted one of them under each window and the third one was planted in the middle. At first I had thought of planting them in containers and just sitting them under the windows but I realized that they could easily be moved by any one wanting to break in bad enough. So I planted them in the ground. Soon I will be adding trellis behind them for them to climb.. Not this year but in the next couple of years they should be tall enough and thick enough to prevent some one from trying to access my windows while I am sleeping. As an added bonus, I can open my windows when the roses are blooming and enjoy their beautiful scent when ever I want plus I will have the hips in the fall to make herbal tea and remedies. What could be better than that? I still have Jake to protect and alert me if some one tries to get in but having more ways to deter the bad guys makes me feel safer. 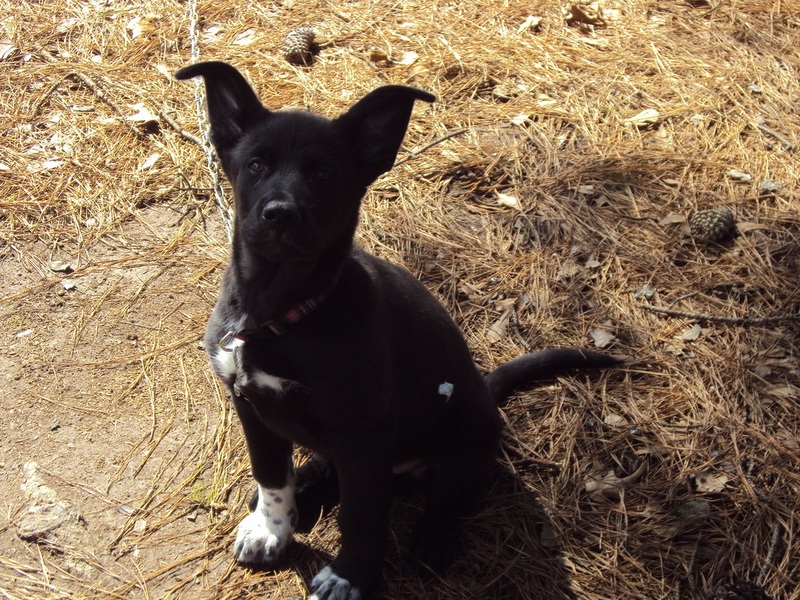 Jake is my German Shepard/Huskey mix but looks almost full Shepard except for the Dalmaitian feet. We have no idea where the feet come from as there are no Dalmatians anywhere near where Jake&apos;s mother lives. Jake will be 3 months old this Saturday and he has grown quite a bit. He now weighs 20 lbs and his head comes up to my knee. You can not see any Husky in him which disappointed my husband but I think Jake is going to be a pretty black German Shepard. Of course, I may be biased so I will let you judge for yourself. Jake is my little shadow. He follows me where ever I go even in the house and if some one new gets to close to me he steps in front of me and sits. There is only one thing about Jake that worries me. Believe it or not he is scared of the dark. He will not go outside after dark to relieve himself unless I push him out the door and he will not leave the deck unless I go outside with him. I hope he outgrows this when he gets older. I have people tell me all the time you can't fry foods outside, you can't bake, you can't do this or you can't do that. When are these people going to learn that when they tell me I can not do something I am going to be hell bent on proving them wrong? One of my husband's cousins asked me what I what going to cook for supper tonight. I had already planned on cooking chicken but was thinking of baking it in the oven with rice and cream of chicken soup. Hubby decided at that point to join in the conversation and state that he would like to have some fried chicken so I said okay I would make that and it would give me a chance to cook outside again. Right away his cousin popped up and said it would be impossible to fry chicken on the little sportsman grill. I told her "Bet me!". LOL Since we were not going to have baked chicken and rice I decided to change the menu to fried chicken, Stovetop chicken stuffing and creamed corn. When it came time to start cooking I set up my sportsman grill, laid the makings for a fire in it and fired it up. Then I got my two rocket stoves ready for cooking. Once the fire was going good in the grill I placed the oval fryer on top and poured the oil in. When the oil was hot enough I added the floured and seasoned chicken. Next I started the rocket stoves. 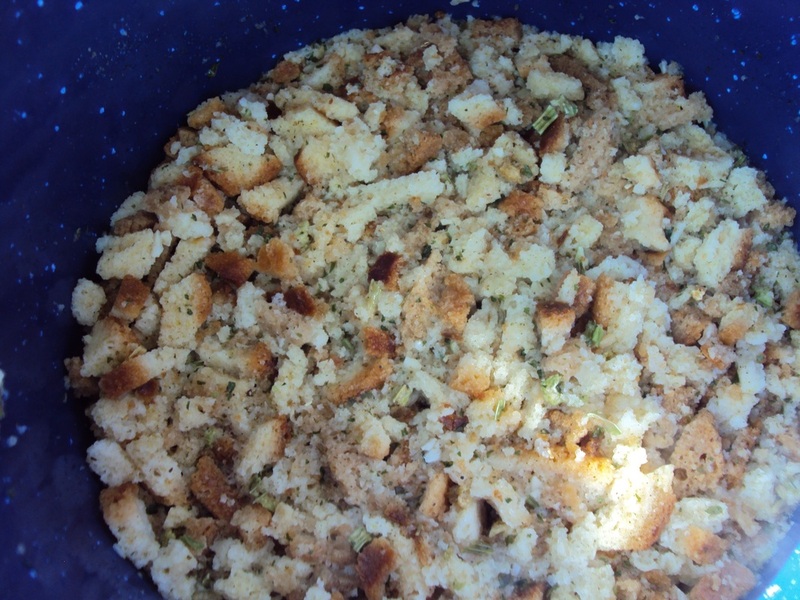 When the fire got going good in them I set the pots of water for the stuffing mix and the corn on them. After I got them going it was time to check the chicken. As you can see it is starting to brown nicely. :) And you can see where the oil is bubbling. I placed the lid back on the fryer and in a few minutes I checked it again. It was time to turn it again. It is getting browner but not quite done yet. Mean while the corn is nice and hot and the stuffing is done. Yay the chicken is done. Nice and crispy brown. Anyone want a leg? I have to admit that I had the fire a little to hot on one end so a couple of pieces of chicken got a little burned as you can see, but not to bad to make it inedible. Two great prep items every prepper should have. For Christmas I received a Lodge Sportsman Grill as a gift from a good friend. Today it was finally nice enough to use it out side. You are suppose to use charcoal in it but I had heard and seen other use wood in theirs so I went with wood. Then today I received the Bayou Classic 6 quart Oval Fryer with Griddle Lid as a early birthday present from another good friend. I washed and seasoned the fryer as soon as I got it unwrapped and then used it to cook fried potatoes on the sportsman grill tonight. Let me tell you, even though these two products are not made by the same company they work together perfectly. As soon as I got a good fire going in the grill I sat the fryer on top and pour in some vegetable oil. Once the oil got hot I added the potatoes. I placed the lid on and let them cook for a few minutes then turned them. They were already starting brown nicely and getting soft inside. I cooked them for a total of 15 minutes and got a nicely cooked pan of fried potatoes. And clean up was a breeze. All I had to do was wipe out the pan with paper towels after it cooled some and it is ready to go again. Sorry I forgot to take a picture after wiping it out with paper towels but I wanted to get this blog post done because I have some more posts I want to do either tonight or tomorrow. Along with the fried potatoes cooked in the fryer on top of the grill I also fired up the rocket stove and heated up some frozen barbacued pulled pork. I had planned on cooking something else tonight until I got the fryer and I quickly changed my mind because I could not wait to use the fryer and grill together. I personally feel that every prepper should have the sportsman grill and the oval fryer in their preps. These are two very durable pieces and you can use free fuel in the grill for cooking once your other cooking fuels run out. It is a win/win so what is not to like about them? You will be seeing more posts on these two pieces in the future from me as well as Southern Wood Elf as I know she has the sportsman grill to. Even though I have a nice gas grill I can tell you right now that I will be using the sportsman grill and the oval fryer a lot more than that gas grill. I love cast iron and I love my good friends for caring enough about me to send me these to pieces of pure gold.